Responsive design is not a new concept, but with the explosive growth of mobile devices it’s starting to get noticed again, especially by email marketers. Cisco recently conducted a GIGANTIC report on global mobile data usage that estimates there will be more internet connected mobile devices on the planet than humans by the year’s end. What’s more, they predict that by 2016 there will be over 10 billion devices worldwide...that’s 1.4 for every person in the world - WOW! More people reaching for their smartphone as their portal to the web also means more people are checking email on those devices. For email marketers, this means your work must look good on small screens, too. What the snippet above does is to check if the device viewport is less than 480 pixels, which is the width of the average smartphone screen in landscape view, and activates a special set of style commands if that condition is met. So if you're looking at a responsive design on a smartphone, the style commands that are triggered by the media query can do all sorts of handy things like increase font size to improve readability, collapsing a two column layout into one column or change the size of an image you don't want to take up prime real-estate on a mobile screen. These 3 things working together can make for a much better mobile viewing experience and keep your email subscribers happy! That being said, responsive email templates aren’t for everyone. They will definitely work best with text heavy vs. image heavy emails. Additional thought and development time needs to be put into design if you intend to make it responsive. 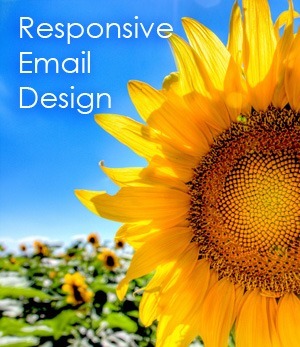 Check to see if a large enough portion of your list is reading email on mobile devices to see if the opportunity costs of developing a responsive template are warranted. Need help getting started? Give us a ring to evaluate your needs!